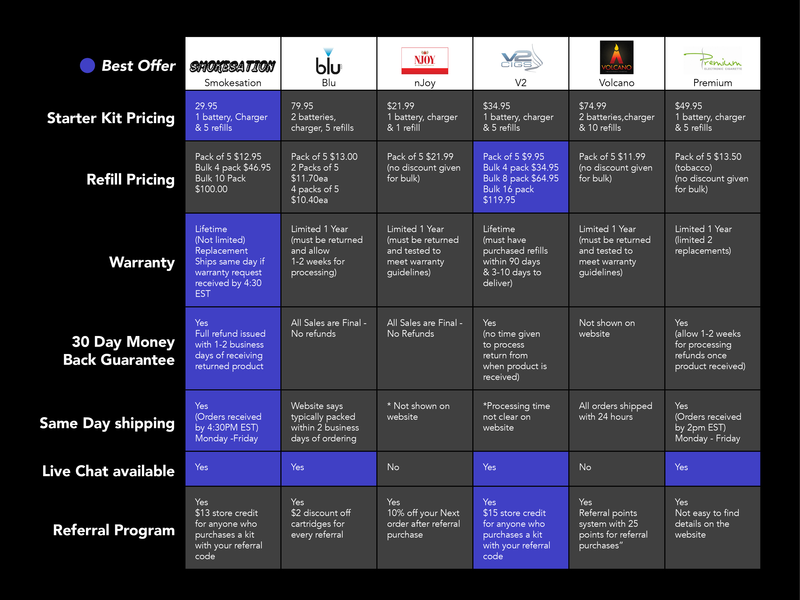 Take a look at how Smokesation compares in pricing, value, warranty and service vs the other major Electronic Cigarette companies. These values were taken directly from their websites vs Smokesation so feel free to check for yourself. The only items that Smokesation is not clearly an industry leader in are refill prices and referral program rewards. But if you look at our typical 10% off coupons and specials we are right in line with V2 for pricing and both companies referral bonuses are right in line to reward you with a FREE box of refills for every referral you bring. Go Ahead and check for yourself...........................we are #1! !